Citation: C N Trueman "The Spanish Civil War"
The Spanish Civil War started in 1936 and finished in 1939. The forces on the right were lead by Generals Franco and Sanjurjo. They were known as Nationalists. The forces on the left were lead by Azana and were known as Republicans. At the start of the war, the cities of Cadiz, Saragossa, Seville and Burgos declared their support for the Nationalists. Madrid, Barcelona, Bilbao and Valencia declared for the Republicans. The Nationalists received help from Nazi Germany in the form of the Condor Legion from the Luftwaffe – Germany’s air force. 50,000 “volunteers” from Mussolini’s Italy also helped the Nationalists. The Republicans received help from Russia. Stalin sent advisers and technicians. An International Brigade comprising of volunteers from all over the world also helped the Republicans. However, the Nationalists held the advantage in the sense that those who fought for them were professionals – the “volunteers” from Italy went to fight with Mussolini’s approval and many of these volunteers had a military background. The Republicans relied on real volunteers; many held idealistic beliefs but had minimal military training. At the start of the war, the military strength of the Nationalists gave them the upper hand. By the end of 1936, 50% of Spain was controlled by the military including the whole of the border with Portugal – a vital supply route. In the east and north, the Basques and Catalans held out far more effectively and the impact of the Nationalists here was minimal. 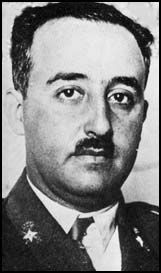 Franco decided that the only way to succeed was to split the Republicans in half. The crucial battle here was the Battle of Guadalajara which the Nationalists lost. This ended their attempt to split the Republicans in half in that year. However, the capture of Bilbao in 1937 was an important victory for the Nationalists. The Nationalists were far more successful in 1938. By August 1938, the Republicans had been split and by December the Nationalists had been successful in Catalan. However, throughout the whole of 1938, Madrid held out. In 1939, Republican resistance all but collapsed. The various factions in the Republican movement were at odds as to what to do and Russia withdrew its support for them. By 1939, it was only a matter of time before the Nationalists won. Barcelona fell in January 1939, Valencia and Madrid surrendered in March 1939 and the Republicans unconditionally surrendered on April 1st. The war is thought to have cost 500,000 lives though official figures have now put the casualty figure as high as 1 million. The war also witnessed the first ever deliberate aerial bombing of a city. On April 27th 1937, the ancient city of the Basques – Guernica – was bombed and destroyed by the Condor Legion of Germany. For Hitler it was a useful experiment into the value of bombing civilian targets. For the Nationalists, it took out a city of spiritual importance for the Basques. For Europe, the warning posed by this bombing was obvious. Hence the attempts by Chamberlain and Daladier to create a formula for Europe to avoid any chance of a repetition of Guernica. Aerial bombing and its consequences were to terrify western Europe.